July the 4th is just around the corner. I don't know about you all, but this summer is going by so fast for me. With canning and putting up vegetables from the garden in the freezer, I am loosing track of time. 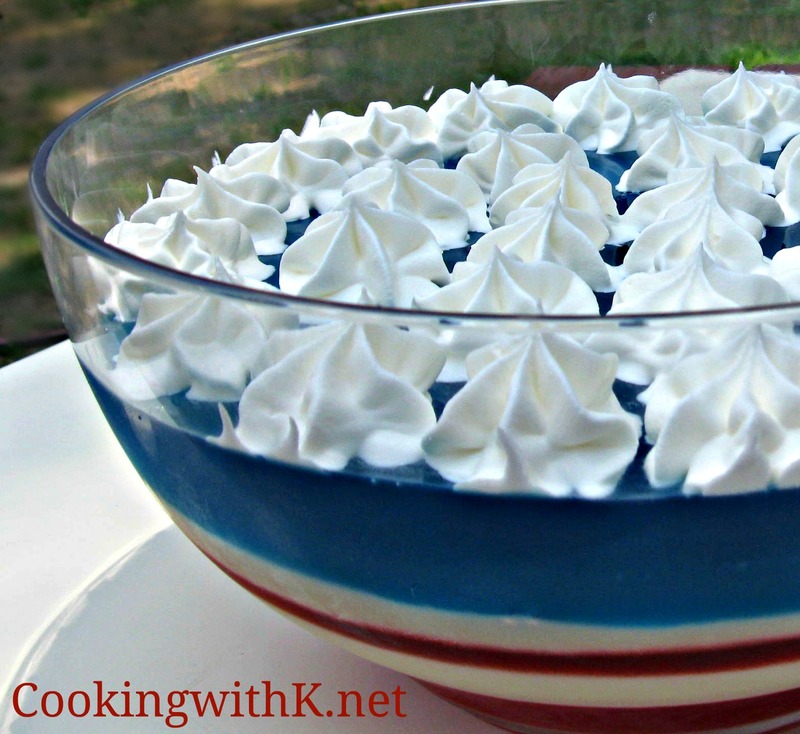 I decided to stop for a little while today and post this fun Red White & Blue Jello Dessert that my grandchildren and I made last year for the 4th of July. This is one that I never got around to posting. We had so much fun making it, and with our 100 degree temperatures here in Texas, you could say, it was the coolest dessert to make! Ha! Ha! There are some really cute and yummy recipes that are made with jello on Pinterest that I have pinned. We came up with using strawberry jello for the red layer and blueberry for the blue layer. The white layer is sour cream sweetened with a little powder sugar. We decided to layer the jello in a large bowl as you can see and top it off with some sweetened whipped cream. This is a simple and easy to make dessert that only calls for a few ingredients. Stay Safe and enjoy the 4th of July Everyone! In a medium bowl, add 1 carton of sour cream with 1/2 cup of powdered sugar; set aside. Make strawberry jello according to package directions. Pour half in the bottom of a large dish. Chill in the refrigerator until jelled enough to spread a layer of sour cream mixture (depending on how large your dish is will depend on how much used). Pour remaining strawberry jello over the sour cream mixture and chill in the refrigerator until jelled. If you have any sour cream mixture left, use it. If not then mix the other carton of sour cream with 1/2 cup of powered sugar and spread over the jelled jello. Prepared the blueberry jello according to package directions and pour all of it over the sour cream mixture. Chill until jelled. Before serving pipe whipped cream using a star tip. Note: Depending on how sweet you like your sour cream mixture, you can use more powdered sugar or less. For Those who do not like sour cream or cream cheese, you can substitute your favorite pudding. It needs to be a thick consistency. You might find this recipe linked here! Oh Kay, my grandgirls are going to LOVE THIS!! Thanks for the fresh and cool recipe sweetie! Enjoy your weekend too. So patriotic! So pretty! So yummy! If you do not like sour cream or cream cheese what would be a good alternative filling? FABULOUS & BEAUTIFUL Kay! I love love love it. Thanks for sharing - I love simple ingredients too and do believe I'm gonna have to make this for the 4th. ;-} Thanks so much for sharing. What a pretty dessert! I love the layers, and of course, the colors! My mom did something similar to this for Christmas with red and green Jello when I was a child. It is still one of my favorite memories. This looks very festive. 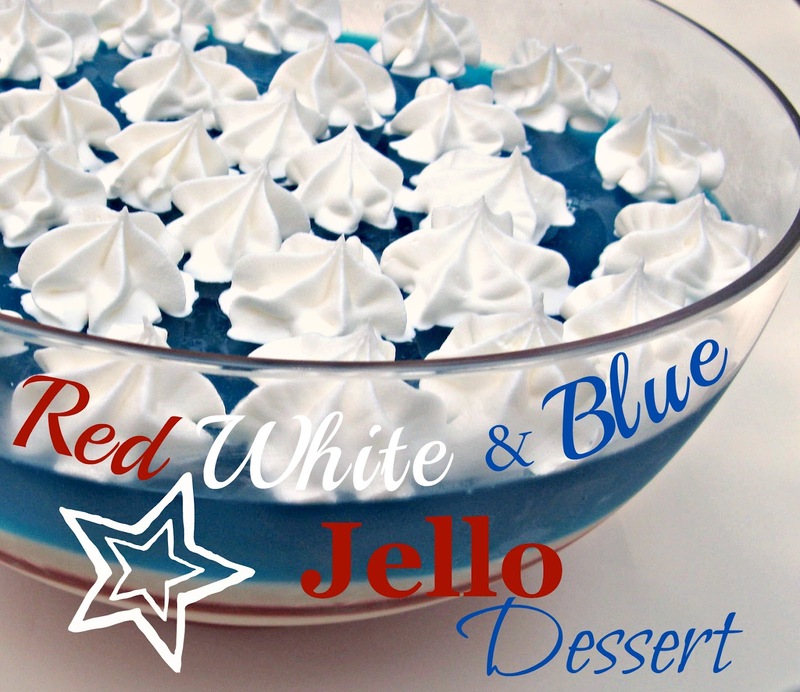 Love red white and blue jello deserts. Thank you for sharing. What better way to celebrate than with a great Jello Salad, very festive. Hope you are having a great holiday week and thank you so much for sharing with Full Plate Thursday. Kay~ This is adorable! Visiting from Freedom Fridays! If I opt to use the cream cheese, should I use two, 8 ounce packages? Should I mix the powdered sugar with the cream cheese before I spread it over the jello? Yes, I would use two 8 oz. packages of cream cheese and mix the sugar in the cream cheese before spreading….hope this helps.